Please be assured that your items will ship out within two business days of reciept. If item is in our store it will ship out right away. Otherwise, some of these items are custom made to your specifications and are thus made to order. Please understand that it is impossible to carry in store every combination of every piece of jewelry that we offer to you. We ship all packages at this time through the U.S. Postal Service (USPS). If you are trying to estimate when a package will be delivered, please note the following: Credit card authorization and verification must be received prior to processing. USPS deliveries occur Monday through Saturday, excluding holidays. All packages can be tracked through USPS.com. If you choose to insure your package at checkout, we only charge what the post office insurance rates are. These start off at $1.75. If you do not insure your package, we can not send you a replacement if it gets lost in the mail. Shipping Prices are as follows. Please note: Custom order and Anodized items cannot be returned. So please be sure of what you want, before you order it. 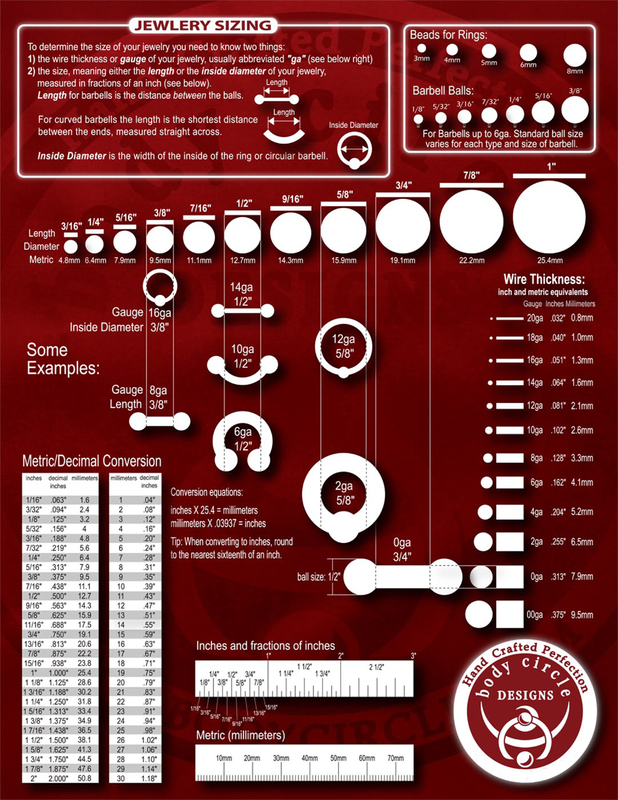 If you are unsure of length, gauge or diameter, please send us an email or refer to our jewelry sizing chart, courtesy of Body Circle Designs. Every item that is shipped in your order will be sealed. If you want to return an item because you are dissatisfied with it, you are more than welcome to do so as long as the items seal is not broken. The reason we cannot accept a unsealed item is that the item in now considered used and/or possibly has been worn. This is for your protection. We do not re-sell used jewelry. When you buy from Diablo Body Jewelry, you are guaranteed not to get a used item or previously worn item. We do not refund shipping cost or the optional sterilization fee. ATTENTION!!! We cannot accept returns if they are sent to us in a regular envelope. The mail sorters often snag on the jewelry and the jewelry is either ripped out of the envelope or damaged. Please send them back in a bubble mailer, just like we sent them to you in. Returns send in normal envelopes will be refused.